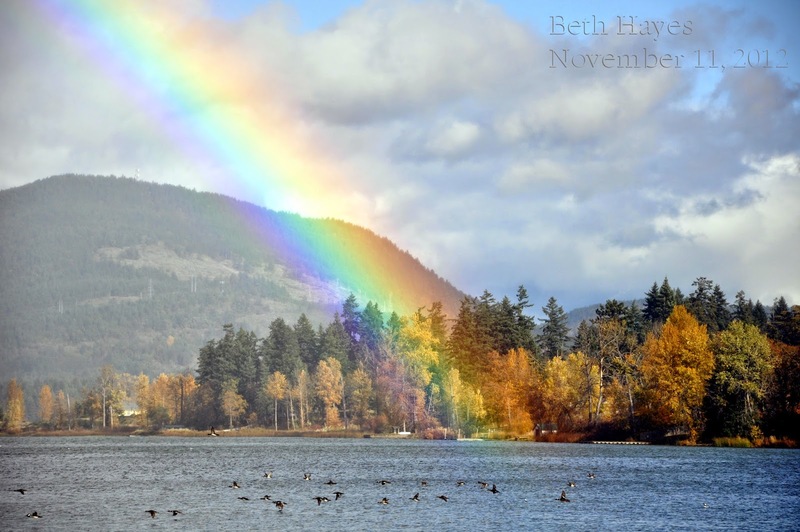 This is one of my very favourite November photos. It was taken on Remembrance Day, two years ago. Folks had gathered that morning at the cenotaph, shoulders hunched against the pouring rain and then, not an hour later, the rain stopped. I'd gone for a drive with a dear friend, and ended up at Quamichan Lake just as the sun broke through. Hello rainbow! Today is a different sort of day: Clear blue skies, enough of a breeze to carry swirling leaves past the window, crisp air. Those gathering for the memorial service will be grateful for the fine weather. Here in my little town, the cenotaph is in the heart of the community, in a tree sheltered park right beside the railroad station. Townsfolk will begin gathering there an hour or so before the service, and will watch our veterans make their way down the main street in a small parade. There are fewer elders now. The first names carved on the cenotaph are those of young men who died a full century ago. Those who served in WWII are in their 90's. Those who went to Korea, not much younger. It's touching to see them still make this annual journey. Today, I'm grateful for the fine weather we have to make this observance. I'm grateful that we still have WWII veterans among us; a living reminder of service and sacrifice, and of the freedoms we enjoy because of them. I'm grateful for the men and women who have served in the decades since as peacekeepers, and for our very Canadian commitment to the processes of negotiation. I'm grateful that we honour those who are commited enough to their beliefs to serve. Without them, we would not be the country we are now, nor would we enjoy the freedoms so many take for granted.